6.5 Grendel 123 Grain Lapua Scenar- The 6.5mm Grendel is an improved variation of the 6.5mm PPC. Since its introduction, it has proven to be a versatile design and is now expanding out into other firearms including bolt-action rifles and the Kalashnikov system. The 6.5mm Grendel design goal was to create an effective 200–800 yard AR-15 magazine-length cartridge for the AR-15 that surpassed the performance of the native 5.56mm NATO/.223 Remington cartridge. Constrained by the length of the 5.56×45mm NATO round, the Grendel designers decided to use a shorter, larger diameter case for higher powder volume while allowing space for long, streamlined, high ballistic coefficient (BC) bullets. The cartridge developer, Bill Alexander, has been quoted as saying he was looking for a cartridge with “more legs” (i.e. longer effective range) than the .50 Beowulf so that it could be used for white tail deer hunting. The round’s original marketing for military and police usage created skepticism about its suitability for hunting. Despite this, there has been critical acknowledgement that it is sufficient for deer. Its manufacturer is more enthusiastic, saying that it has “flat trajectories and bullets well-suited to deer and varmints”. It is similar to deer cartridges such as the .30-30 Winchester, .257 Roberts and .243 Winchester but is not in the same class as the .270 Winchester or the .30-06. Now that bolt action rifles are being offered in 6.5 Grendel it is appearing at target matches and metallic silhouette competitions. 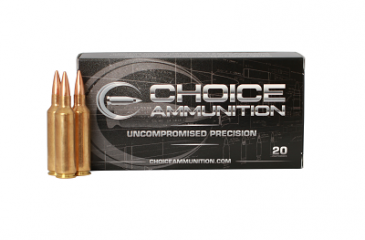 Choice Ammunition has taken our 100% hand-loading techniques and produce an extremely accurate, highly dependable round for the 6.5 Grendel in this load. Our loading tolerances are only matched by passionate hand-loaders in their own loading rooms. Consistent seating depths, powder charges and proprietary formulas of Choice Ammunition, make this 123 grain Lapua Scenar round the best you can buy on the commercial market today. We are offering more bullet selections in the near future for this caliber. Lapua Scenar match bullet represents the very high end of its class: it has achieved the 600/600 world record of the international sport shooting federation (ISSF). Consistent quality that starts with the raw materials makes this possible. Lapua bullets are practically handmade. The first choice for serious target competition. Lapua Scenar hollow point boat tail bullets have given superb results at long ranges and bench rest shooting.The Scenar bullets have the IBS World Record in 600 yard Heavy Gun 5-shot group (0.404”) and also hold the official world ISSF record of 600 out of 600 possible, an unbeatable score. 6.5 Grendel 123 Grain Lapua Scenar-The 6.5mm Grendel is an improved variation of the 6.5mm PPC. Since its introduction, it has proven to be a versatile design and is now expanding out into other firearms including bolt-action rifles and the Kalashnikov system. The 6.5mm Grendel design goal was to create an effective 200–800 yard AR-15 magazine-length cartridge for the AR-15 that surpassed the performance of the native 5.56mm NATO/.223 Remington cartridge. Constrained by the length of the 5.56×45mm NATO round, the Grendel designers decided to use a shorter, larger diameter case for higher powder volume while allowing space for long, streamlined, high ballistic coefficient (BC) bullets. The cartridge developer, Bill Alexander, has been quoted as saying he was looking for a cartridge with “more legs” (i.e. longer effective range) than the .50 Beowulf so that it could be used for white tail deer hunting. The round’s original marketing for military and police usage created skepticism about its suitability for hunting. Despite this, there has been critical acknowledgement that it is sufficient for deer. Its manufacturer is more enthusiastic, saying that it has “flat trajectories and bullets well-suited to deer and varmints”. It is similar to deer cartridges such as the .30-30 Winchester, .257 Roberts and .243 Winchester but is not in the same class as the .270 Winchester or the .30-06. Now that bolt action rifles are being offered in 6.5 Grendel it is appearing at target matches and metallic silhouette competitions. 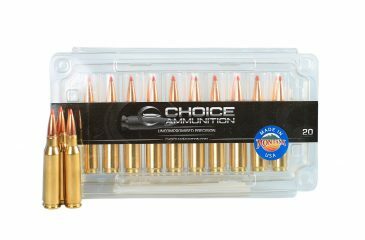 Choice Ammunition has taken our 100% hand-loading techniques and produce an extremely accurate, highly dependable round for the 6.5 Grendel in this load. Our loading tolerances are only matched by passionate hand-loaders in their own loading rooms. Consistent seating depths, powder charges and proprietary formulas of Choice Ammunition, make this 95 grain Hornady V-Max round the best you can buy on the commercial market today. We are offering more bullet selections in the near future for this caliber.